Anhui TEU Forklift Truck Co.,Ltd. 1.5 ton electric forklift adopts storage battery to provide power. It is suitable for those areas that need high requirements of environmental protection, such as indoor place and warehouse. This electric forklift truck adopts drive system with independent design, low noise and high efficiency. We also select imported motor and electric control units to ensure high reliability of hydraulic parts. Meanwhile, due to our adoption of advanced noise reduction technology, there is no need to worry about the noise produced by 1.5 ton electric forklifts any more. 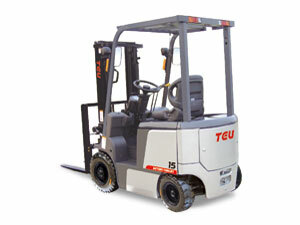 TEU can customize different types of electric forklift trucks according to customers' demands. The lemon yellow type and silver type are available for customers. All our electric forklifts are characterized by environmental friendliness, low operational noise and reliable performance. They are sold at economical prices. TEU 1.5 ton electric forklifts are designed with getting-on pedals considering drivers' operation habits. It greatly reduces the height of the heels and increases drivers' footstep space, thereby reduces fatigue. This type of electric forklift truck can be configured with suspending seat that makes them feel more comfortable. Other advantages of our 1.5 ton electric forklifts include high energy conversion efficiency and comparatively low maintenance requirements. The height of getting-on truck pedal is 350 mm. The width increases to 40 mm. The height of front baseboard reaches 490 mm. Electric forklift truck is mainly made up of power unit, transmission, steering device, working device, hydraulic system and brake device. Founded in February 2007, Anhui TEU Forklift Co., Ltd. is a professional manufacturer and supplier of electric forklift trucks in China. Our company is also engaged in producing 1.5-10T diesel forklift and 2-4.5T gasoline forklift truck. TEU possesses vehicle assembly lines, painting lines, standard test sites and various testing and detection equipment and facilities. Our annual production capacity can reach 10,000 units. We have exported our 1.5 ton electric forklifts or electric forklift trucks to Australia, Russia, the United Kingdom and Northern Ireland, Korea, Iran, Southeast Asia, South America, Africa and Europe.